Houston Ice & Brewing Co. 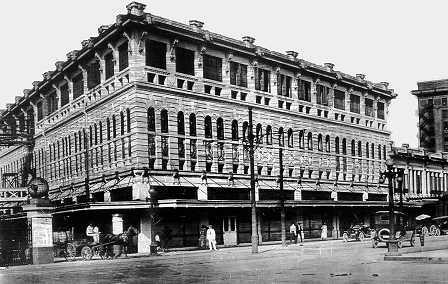 The Magnolia Ballroom building on the Franklin Street side of Market Square (715 Franklin) was built in 1912, on the foundation of an older building (the Franklin Building), and once housed the taproom and executive offices for the Houston Ice and Brewing Co.’s Magnolia Brewery. The building was the first in Houston to have refrigerator-style air conditioning. In 2006, it became the first commercial building in Houston to receive the Houston Protected Landmark designation. By 1915, the Houston Ice and Brewing Company encompassed more than 10 buildings on more than 20 acres located on both sides of Buffalo Bayou. In fact, the brewery even spanned the bayou for some period of time – the Louisiana Street bridge now crosses the bayou at the same location. To provide easier access across the bayou, the brewery built a 250-foot wood and concrete bridge stretching from the Franklin Street bridge toward the Milam Street bridge. 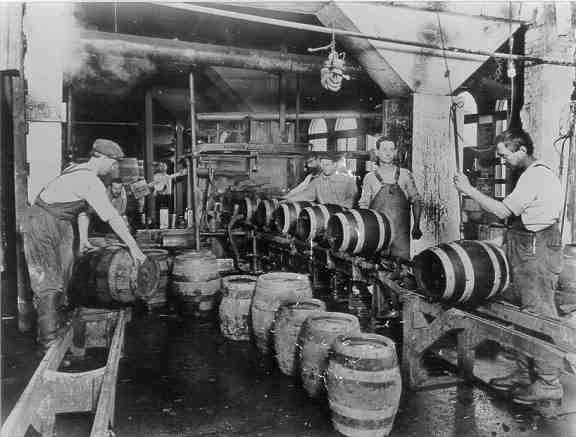 The company’s decline began during Prohibition, when the Houston Ice and Brewing Company was forced to rely solely on its ice sales. Many of the brewery’s structures were then destroyed in the historic 1935 flood, which was later blamed on the Magnolia Brewery bridge. The brewery struggled to survive, but closed in 1950. The Magnolia Ballroom is just one of two Houston Ice and Brewing Company buildings that remains standing. In 1969, a high-end restaurant called the Bismark was located on the second floor, and the Buffalo Bayou Flea Market operated out of the basement. The basement has since housed a variety of bars and clubs. The upstairs floors are currently used for special events – much of the ornate interior of the building has been preserved, and it is decorated with historic photos. Gorski, L.C. and Aulbach, L.F., “Oktoberfest in Houston? Breweries on the Bayou,” Buffalo Bayou – An Echo of Houston’s Wilderness Beginnings (2003). This entry was posted in Breweries, Downtown, Market Square. Bookmark the permalink. I first heard about the Houston Ice and Brewing Company on one of the GHPA tours. It is such an interesting story. Great website. I look forward to reading more. I had seen ads for Richlieu Ale in the papers in the 1940s when I was doing some research. I may even have a photocopy of one of those ads around here. They spoke of the use of imported hops and gave an address on Washington Ave. as I recall. I didn’t realize it was connected to Magnolia. Magnolia may have produced a coffee at one time. In the 20s I saw ads for Wamba Coffee (“it’s a good shot”) from the Magnolia Coffee Company giving an address on Commerce. What about Peerless Beer, another local big seller in the 40s apparently, from Jax? Was that produced locally? 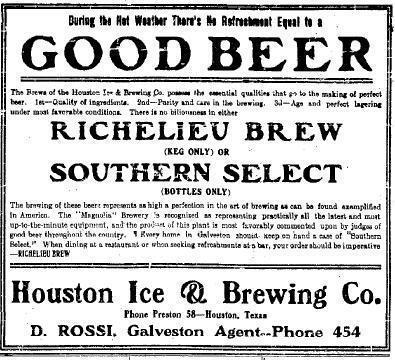 It was the Magnolia Ballroom website that mentioned Richlieu Beer, so – in combination with the reference you found – it sounds like it was indeed a Houston Ice and Brewing product. Would love to see a picture – I hadn’t found any. I remember seeing your HAIF post on Wamba Coffee, and I’ll post a photo above. I hadn’t heard of it before, but it pretty clearly mentions Magnolia and Houston on the can, so it looks like that’s another Magnolia product. Although, the can does say “Magnolia Coffee Co.” and not “Magnolia Brewing” – and I haven’t found any explicit connection yet. But I couldn’t find anything connecting Peerless to Houston or Jax. I posted a picture above, but everything I saw referenced La Crosse, Wisconsin. An update – I have not been able to find the Wamba ad or one for Southern Select; I had these out recently to scan and post on a HAIF thread on ‘made-in-Houston’ but never got around to it and now have misplaced or misfiled them. I did find a reference in my notes to a Southern Select beer ad in the Post on 10/1/46, p. 1/5: ‘Smooth, Mellow, Swell. Second to none. Galveston Houston Breweries, Inc.’ That was probably the one I photocopied but there were ads for Southern Select every day. In the paper for the 17th, I noted several ads that I intended to go back and photocopy but never got around to, thanks in part to the contrariness of the copy machines at HPL. One ad was for Silver Fox Extra Pale, brewed with imported Austrian hops, Anderson Distributing, 7430 Washington. That is what I was remembering as Richlieu; I don’t know now where I saw a mention of Richlieu; a couple of scans of all my notes has not yet turned up a mention. I did find an ad for Peerless, which sponsored before and after the game shows of Buff games. It says ‘Premium Quality Since 1856, Distributed by Jax Beer Co., Houston Texas, E.A. Rossi, Pres., 1111 Live Oak St. Houston.’ I take it ‘distributed by’ means the beer was not brewed here; same for the Silver Fox. I didn’t remember the ‘distributed’ in the Peerless ad but I guess that ties in with the Peerless you found. Where did you find the Wamba can? I remember ads for 4 coffees in the 20s: Cheek-Neal’s Maxwell House (Good to the Last Drop), Duncan Coffee Co.’s Admiration Coffee (It’s Cup Tested), Wamba (It’s a good shot) and International Coffee Co.’s Sunset Coffee. I also saw ads for Admiration coffee in the 40s and mentions of Admiration Coffee Shops. I remembered Maryland Club coffee as Duncan Coffee Co.’s leading brand; apparently Admiration was before that. If I find those ads I’ll let you know; otherwise my research project is on hold while the main library is closed. Interesting! Hope you find the ads. 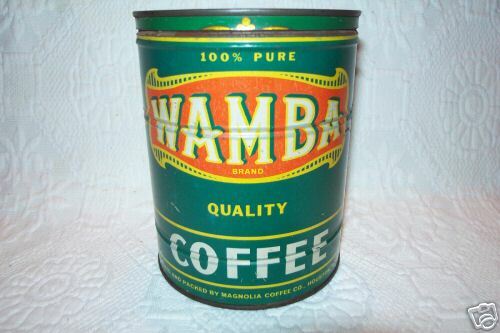 Can’t remember for sure where I got the Wamba can photo, but I’m pretty sure it was off an ebay auction. I’ve added a newspaper ad for Southern Select and Richelieu Brew. These appear to have been pretty common in the 1909-1911 time period. We have a can(bucket) that has the “Magnolia Coffee Co.” Houston Texas. We were curious about the Co. I Goolged Magnolia Coffee Co & saw this response & that they may have made coffee at one time. The can is green. Marty – There was a Magnolia Coffee Company incorporated in Houston in 1909. And I have a 1916 newspaper article saying that a representative from that company is going to be giving a demonstration of Wamba coffee. So I think we can at least say that the can you have was likely made by the same company that made the Wamba can pictured. The company’s president from its founding until his death in 1921 was an M.H. Epstein – and it looks like he may have been replaced by his son. The only Houston address I’ve seen associated with the company so far in newspaper articles is 2001 North San Jacinto, but note the Congress address reference in a prior comment. The address I saw was in a 1932 article, which is the last local newspaper article I saw referencing the company. I still don’t know if there’s a connection between the coffee company and the brewery – but at least that gives you some more information about the coffee company. I guess I own a small piece of history. I have a thermometer from this company. It was proberly given as promotional item to customers, i.e., grocery stores, gas stations or bars. This one I bought many years ago from a antiques store that was once a gas station/local grocery store. I have a ceramic Hackerbrau Beer mug in my stein collection. On it is the American Brewing Association name and Houston, Texas. In relation to Houston Ice and Brewing winning the Grand Prize for beer in early August 1913, I was told of a celebration that took place. A banner was stretched across the street from the Rice Hotel to the Binz Building that said “Southern Select, the Beer that Made Milwaulkee Jealous!” Does the Houstorian have anything on this? Any suggestions on how to research this? It’s remarkable to pay a visit this website and reading the views of all colleagues on the topic of this article, while I am also eager of getting familiarity. Pulled up your page because while digging a footing for a new home in Chattanooga’s oldest subdivision, St. Elmo, I dug up a sign with the excavator. It is a gauge of metal that’s close to a street sign (heavy). It is rounded like it may have been mounted on a barrel. It says Houston Ice and Brewing Company, Magnolia Brewery, Houston Texas. Only the edges are rusty. Wondering if there are many original signs like this around out there in TX? Can you send a picture to psb@airmail.net? I’d love to see it.